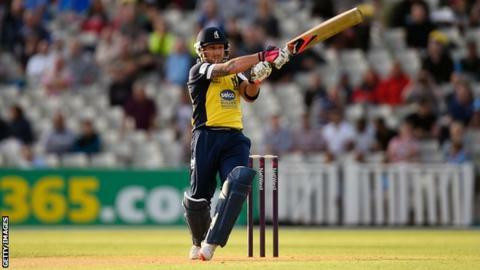 Birmingham Bears opener Brendon McCullum is targeting his final home game to produce something special for the defending T20 Blast champions. The New Zealand captain scored 158 not out, the competition's highest score, against Derbyshire in his second Bears game and his first at Edgbaston. McCullum, 33, faces Northants in the penultimate match of his seven-game stint with the team on Wednesday. "Hopefully I can contribute something in the last two matches," he said. The Bears, who lie second in the North Group, suffered only their third loss of the competition on Friday when they were beaten by Lancashire - a game in which McCullum scored 43, his highest total since his record-breaking knock. "I enjoyed the innings against Derbyshire, of course, but I have also enjoyed the smaller contributions that I have made which helped keep us in a strong position in the group," added McCullum, who has not ruled out returning to the Bears if they reach Finals Day at the end of August. "The team winning is what counts and I am pleased that we have been doing that most of the time. It's all about contributing to the team." Victory over Northants will seal a home quarter-final for the Bears, ahead of their final group match at Yorkshire on Friday. Brendon McCullum's innings against Derbyshire was the highest score in T20 Blast history, and the second highest in all T20 cricket, behind Chris Gayle's 175 not out. He is the leading run-scorer in the history of international T20s, having scored 2,140 at an average of 35.66, including two centuries. McCullum smashed an 18-ball half-century as New Zealand beat England at the World Cup earlier this year. His scores in this season's T20 Blast have been 18, 158 not out, 6, 15, and 41.